Beauceron Dogs - The Beauceron is a herding dog breed from France. It is also known as Berger de Beauce, Bas Rouge or French Shorthaired Shepherd. 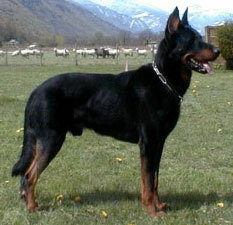 The Beauceron's coat is short, close and smooth except on legs, tail and flanks, where there is a slight fringe. Beaucerons have double dewclaws. This muscular breed is described as intelligent, friendly, very calm and protective of children. They are perfect for both inside and outside the house and can be trained for different activities. This information is licensed under the GNU Free Documentation License. It uses material from the Beauceron article on Wikipedia.org. Beauceron Breeders - Advertise your kennel puppies and dogs here.